My sister, Penny, and I have been talking lately about aprons. Her daughter wears aprons while working in the kitchen. Penny and I never much did. We’ve read that the younger generations of women are intrigued by aprons, are buying and actually wearing them. “Vintage” aprons are sold on eBay! But when Penny and I became housewives in the early 1960s, did we consciously rebel against the apron tradition? Did other women in our generation? Our mother (Ernestine/Ernie) and grandmother (Ruth, called by us Ma) always put on an apron in the kitchen, aprons made by Ma. Some were pinafore aprons with ruffles and various pretty patterns. We especially remember one that had a pattern of strawberries. And I’ve written elsewhere about my very early memory of being in the garden with Ernie, who was wearing a pinafore apron. I don’t remember the pattern, but I remember ruffles over the shoulders—and a pocket from which she produced a salt shaker. She picked a tomato, salted it, and we ate it, warm and sunny. In our childhood, Ernie mostly wore housedresses, donning slacks more often by the time we were in our teens (when she wasn’t dressed up for her return to work then, a law-office-secretary job that demanded dress, girdle, nylons). Ma always wore a dress or skirt. Pinafore aprons were serious protection against kitchen spatters on clothes that had to be ironed after washing or had to be dry-cleaned. Is that the difference? Penny and I started out our young-married years well-supplied with aprons, but we usually cooked in jeans and sweatshirts and such. Easily washed, aprons not necessary. Ma made regular aprons also, with bibs and without. There was one bib style that you didn’t have to pull on over your head (“and muss your perm,” as Penny recalled. Ernie and Ma did have perms). This type was designed with two straps that fastened behind your neck with a button. Ma made bib-less dressy aprons, too; hostess aprons. Penny still has one, in a pattern of roses under an overskirt of see-through chiffon, its chiffon pocket trimmed with the roses fabric. The first project in Laconia Junior High home ec’s sewing class was making a placemat and napkin and matching apron. At Baker’s Remnant Store on Main Street, I chose yellow plaid cotton, a sort of gingham. After we students struggled through the ordeal of sewing them, we used them in our cooking classes and, when home ec ended, we took them home. So I had my very own handmade apron for cooking in my mother’s kitchen. When I was sixteen I bought my next aprons, two of them, while buying two uniforms for working at Sawyer’s Dairy Bar. Like the uniforms, the aprons were white nylon. They were small, not quite French-maid style but similar and barely adequate for wiping ice-creamy hands on. The uniforms and aprons accompanied me to my next summer job of waitressing at Keller’s Restaurant on Main Street. When Penny (two years younger) started working summers, she waitressed at an inn that supplied aprons from an assortment from which you picked out your size. We both recall that in order to tie a prettier bow, we put our aprons on backward, tied the bow in front, and spun the aprons around. Then came college and those young-married years. Then the middle-age years. Penny and I were always interested in cooking and also in gardening. We canned and froze what we grew, but we can’t remember ourselves even wearing an apron while chopping mountains of vegetables for pickles. 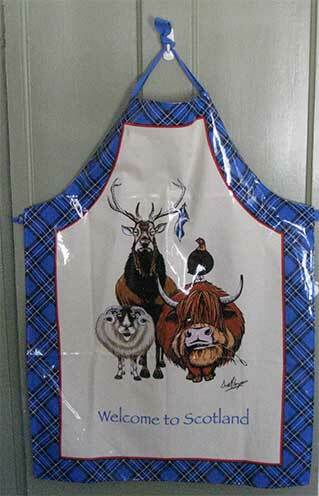 Then, when I was fifty-one (a couple of years older than Penny’s daughter is now), I saw an apron and coveted it. 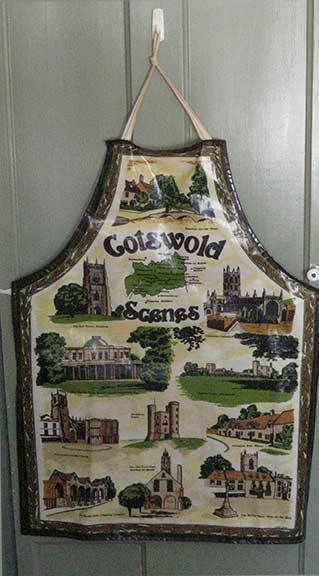 Penny and I were spending three weeks in the Cotswolds, and there in a shop was an apron with scenes of our sightseeing. It cost more than I should’ve spent, but I bought it. And therefore when I got it home I couldn’t simply hang it up to enjoy as a souvenir, I had to use it to justify the expense. So if a meal I’m making is going to be messy, on it goes—and I look down at the scenes and reminisce about the sights and about the food. Bibury . . . that’s where at a tea shop I chose treacle tart with clotted cream . . .
And now we have another apron in our household. A year ago Sheena, a Scottish friend, sent us a Christmas present of a “Welcome to Scotland” apron, saying that when she saw it she thought of Don wearing it and me laughing. And so we do! Speaking of comfort food: on a Maine TV program this winter there was a cooking segment, in which the cook, who’d written a comfort-food cookbook, made macaroni and cheese. She pointed out that originally this wasn’t thought of as comfort food, only an everyday meal. The interviewer asked her for an example of what “old-fashioned comfort food” had been. She replied, “Crackers and milk.” I shrieked with delight—a favorite I haven’t treated myself to in years! Did Ma and Ernie put on an apron just to make bowls of crackers and milk? I can’t remember, but I’m betting that Ma did.